British historian. Shunned by most of his colleagues. Son of a professional illustrator and Royal Navy officer, he worked as a young man at the Torrejón air base [of US Strategic Air Command outside Madrid] as a clerk-stenographer, (marrying the Spaniard Pilar Stuyck -- from whom he separated in 1981), and as a steel worker in the Ruhr, and then as a night watchman on a construction site in London [the New Commonwealth Institute]. There he wrote his first book, The Destruction of Dresden. This gave him fame and academic prestige until his more or less pro-Nazi ideas began to emerge. [In 1977] he published Hitler's War (Spanish edition: Planeta, 1989), a book in which he placed the reader in the dictator's shoes and suggested that he knew nothing of the Holocaust. The work has been noisily criticized by other historians, who consider it inaccurate and intellectually dishonest. Over the years his views about the Holocaust have varied. He has never denied that it happened, but has questioned its importance. This was the reason for his conviction in Austria in 2006 where he spent nine [sic. fourteen] months in prison. He spent them writing memoirs and a biography of Himmler which will appear next year. Since the early 1990s he has no publishers. He publishes his own works and sells them on the Internet with the help of fans. 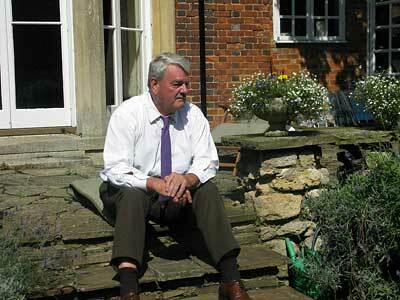 He lives in a country house near to Windsor. He spent the summer speaking from coast to coast in the United States. [Note: What follows is a literal translation of what is necessarily an abridged and sometimes tendentious published account of a three-hour tape-recorded interview. The Spanish translator took many liberties with the original spoken word, and for legal reasons we should make clear that the words used below are not necessarily the actual words spoken by Mr Irving or the interviewer]. Hitler was a simple man for ever being hoodwinked by his subordinates. THE FIRST surprising thing about David Irving is that he drives too fast. As if he had somebody at his tail. It's less surprising that his home is filled with files and microfilms. He is an historian, after all. Or at least so he says. Our conversation takes places in his garden - marked by the noise of the planes landing and taking off Heathrow. Irving drinks a lot of coffee. The girl who prepares it is called Gabriela. He prefers to call her Miss Peru. Q - Had Hitler not existed, would there have been WWII? A - Of course. In the '30s the war was inevitable, but not because of the Nazis, because Europe had ill-fitting frontiers. Churchill occupied himself with the Nazis only from 1936 on. And he did that because he was helped into power by the Jews of London. Q - How is it possible that you are the only historian who says this? A - Because it's not politically correct to say it. Only Mel Gibson says it. Q - Don't digress. I've asked you about WWII. Would it have been possible without Hitler? A - Yes. Then again, Hitler only wanted a small war: to absorb Austria and the Sudetenland and then provoke Poland by taking Danzig. But then after a while he realized that the war wasn't going to be a short one. Q - You have once stated that Churchill was as bad as Hitler. A - What I did say is that Hitler, Churchill, Roosevelt, and Truman are all burning in the same hell. Q - That is, in your opinion they were all equally bad. A - Of course. They had no respect whatsoever for human life. The real crime of WWII was not genocide; it was what I call innocenticide. The killing of innocent people. The murder of the Jews was a crime not because they were Jews, but because they were innocent. But the Jews don't want to hear this, because it lets the Holocaust stop being something special. Q - You mean that there were Jews who were not innocent? A - What I mean is that their murder was a crime because they were innocent. Do you want to say that all Jews are innocent? Because in every segment of the population there are elements that tend toward the criminal, and the Jews are no exception. Q - You put Churchill and Hitler on the same plane, then. A - I've read Churchill's papers, and I remember what he told the officers planning the invasion of France in spring '44. The generals told him that a lot of [French] civilians were going to die and he answered, "How many?" - They told him "About 10,000" And Churchill said, "Okay. That's the tariff they have to pay." To Churchill, human life was irrelevant. Think about the calculated brutality of the bombing of Dresden. Q - And Hitler, wasn't he more bloodthirsty? A - The key question is how much Hitler knew about what Himmler and his SS were up to. And the answer is that Himmler took very great care not to tell him anything. On one occasion Himmler's chief of staff, Karl Wolff, found him depressed and asked him "What's the matter?" - And he answered, "I am doing something that the Messiah of the coming 2000 years must never know." By "the Messiah", he was alluding to Hitler. Q - But why hide the Holocaust from Hitler, if they both had the same goal of exterminating the Jews? A - The allegation that the Nazi leader sought to exterminate the Jews is a propaganda lie. In Hitler's speeches he just repeated the one anti-Semitic utterance. Something about "if they ever begin a world war, the Jews will be the ones to suffer". But it was always the same stereotype expression. Q - Do you mean that Hitler was the only innocent in the Nazi circles of power? A - Hitler was the Head of State, and because of that, he was accountable for what was happening. But one can be both accountable and ignorant. Hitler was a simple man constantly deceived by his subordinates. Q - But you do accept that the Nazis wanted to exterminate the Jews. A - Goebbels and Himmler, yes. But it would be interesting to know why neither the UK nor Sweden nor any other country wanted to accept Europe's Jews? And for that matter also why when Germany asked the Hungarians, the Rumanians, and the Slovaks if they might take care of their Jews, all willingly agreed. Even if as I suppose the mere fact of raising these questions makes me an anti-Semite. A - I try not to be one. Q - Are you or are you not one? A - I try not to be one, but believe me, it's not easy. Q - In a nutshell, your thesis is that Hitler was a good guy, but he was surrounded by bad people. A - Hitler himself said, nearing the end of his days, that National Socialism was good but he had trusted the wrong people. Q - And that is also what you believe? A - I am not interested in politics. National Socialism worked well in Germany, but I am not sure it would be as successful in other countries. Q - Has Hitler become a scapegoat for the Germans? A - He has proved useful to many people because he is dead. 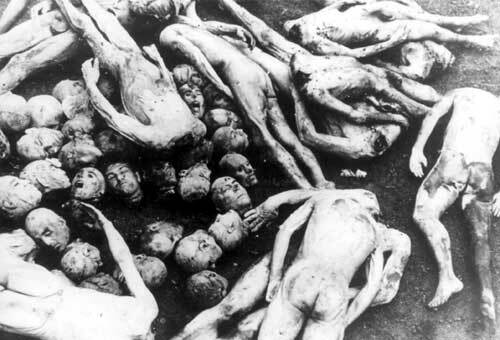 Q - How do you explain, that no historians except you say that the real holocaust did not take place in Auschwitz? A - Because they all copy each other. To jump those rails would condemn them to jail, retribution, and poverty, which is what happened to me. Q - Are you a Nazi? A - That's what they say, but it's not true. The only thing that matters to me is that in a thousand [actually said: hundred] years people won't buy Ian Kershaw's or Andrew Roberts' books, but mine. Because I write Real History. Q - Wouldn't it be less pretentious to say that what you tell is nothing more than just one version of the facts? A - I always encourage my listeners to read other authors too. I am a very liberal guy. Q - Was Hitler a democratically elected leader or a tyrant? A - There comes a moment when even a tyrant is unable to rule without the people's support. Hitler had that support until the very end. In part that was because of Goebbels' propaganda. Q - What about Churchill? Was he a tyrant? A - He was a corrupt politician. He did what the Jews told him to do, and he replaced Neville Chamberlain, who was a man of peace. He pushed the UK into the war and destroyed the British Empire. Churchill was in the hands of the Jews, and if he'd surrendered [actually said: accepted Hitler's 1940 peace offer] he'd have gone down in history as a failure. People would have laughed at him. The war was a personal matter to Churchill. Q - So should he have done a deal with Hitler? A - Of course. We were very close to ending the war in 1940 and then there probably would not have been any Holocaust. Because you can do such things only under cover of the smoke of war. Q - Do you think that the figure of Six Million murdered Jews is exaggerated? A - I'm not interested in figures. "I don't do body-counts." Nor am I all that interested in the Holocaust. I am interested in Himmler. A man who died at age 44, built an enormous industrial empire, raised the Waffen SS out of nothing, and was the architect of the Holocaust. What an "achievement" for a man of forty-four. Q - You will agree with me that the people responsible for the Holocaust are not the Jews, but their killers. A - The problem is that you can't even ask in public whether they were not the architects of their own destruction, because asking that you would land you in jail. That's why no-one asks, no-one answers; and it'll all end up again just as in the 1930s. That's what I want to prevent. I am a humanitarian person. Q - Do you believe that the Holocaust is just a footnote in history books? A - Until the 1970s it was just a blip on the horizon. The proof of that is that it doesn't figure in any of the biographies of the great leaders of the Second World War. But since then it has become fashionable. The Jews have marketed it as a brand, using the same techniques as Dr Goebbels. They have invented a slogan... and repeat it ad nauseam. Q - In other words, in your opinion the Holocaust is nothing more than a slogan. A - A slogan yes. The Holocaust has become just a slogan, a brand-name like Kleenex or Xerox printers. Until the 1970s it was just a haphazard concept, one which included gas chambers, shootings, deportations, slavery... It was a horrific phenomenon, but it was not commercially marketable. They've turned it into a commercial phenomenon, and succeeded in making money out of it - producing films about it which have made millions. Q - You've been accused of absolving Hitler. A - I take the uncertainty out of History. Q - But you used to say that you had to identify with him. Do you consider yourself an admirer of Hitler? A - I admire him because he persevered. In the same sense that I admire Hillary Clinton in her perseverance in pursuing the presidency of the United States. Hitler had ranged against him the most powerful armies in the whole world, but he decided to resist until the end. And had the war lasted another year, he would have - not won, but he would have not lost either. By 1945 the British and the Americans were heartily tired of the war, and they would not have wanted to go on any longer. Q - Was Nazism a step backwards for civilization? A - In some things, yes. For instance, there was nobody controlling the police. But maybe such a regime needs the police to be able to conduct its social experiments. Q - What kind of experiments? A - Those regarding the welfare state. Q - Do you really think that in a thousand years the general judgment on Hitler will improve? A - Of course. There will be squares named after him in Germany, and maybe elsewhere.